What do you get when you combine the product enthusiasm and customer loyalty of Apple, Google’s compulsive drive towards improvement and the slick, urbane look of GQ? 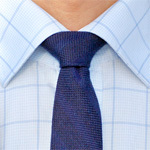 As over 7,000 (mostly repeat) customers can attest – the best bespoke quality suit you’ve ever worn for less than $500. This is the story of Indochino. Indochino, the company, was born in Canada, at the University of Victoria, where two entrepreneurial students hatched the idea out of necessity and fostered it into an international phenomenon. But the spirit of Indochino’s business model has its roots in the reinvention of the tech space. Just as social media gives everyone a personalized voice, Indochino gives every man a suit that fits. And not the shabby, one-size-fits-hardly-anyone thing you’d get off the rack at Macy’s or some mall department store. Indochino’s suits are tailor made to order in record time and FedEx'ed directly to your door in two weeks. The history of Indochino is inspiring, in spite of it only spanning about three years. There’s something populist and revolutionary about it. High quality men’s clothing, like the upper echelons of business, has long been an institution deeply rooted in tradition, exclusive to those with familial or financial legs up. After all, clothes can make a man – and a well-tailored suit is symbolic of the stately cultivation that serves as the runway to a well-connected, well-endowed launch into the corporate world. A gangly guy with the wrong knot in his tie and high-water slacks that reveal his should-have-been-brown socks, on the other hand, bears the hallmark of a neophyte. But without daddy’s tailor and checkbook, getting the right look for that critical job interview is somewhat of a crapshoot. Doing so without spending thousands of dollars is a damn near Olympian undertaking. Indochino co-founder Heikal Gani pulled it off, but it wasn’t easy. Gani bought his first real suit when he was a psychology and political science major at UVic. A conference had come up and Gani had to look the part. Like most of us with our checking accounts close to the edge, the purchase of a suit isn’t exactly premeditated. Unfortunately, a properly fitted and tailored suit can take weeks to attain – especially if you’ve never been measured, don’t know what to buy and don’t know where to buy it. Gani did the only thing a 21st century man without a network of old boys could do – he researched it on the Internet. Being a slimmer guy, he quickly found out that he needed something different than what was on the rack. But in a city with a population of less than half a million on the west coast of Canada, the only place that he could find (and afford) was Moore’s – the Canadian equivalent of Men’s Wearhouse. He got the suit, but wasn’t satisfied. It was boxy, generic and overpriced, considering. After dropping an additional $100 on tailoring, he looked good enough. But the frustrating experience stuck with him. He talked over his experience with his friend and fellow UVic student, Kyle Vucko, a business major, and together, they identified that the problem lay not only in the product, but also in the process. Factory-made suits seem to call upon the man to fit the suit, rather than the reverse. It’s like something out of a dystopian novel about cubicle estrangement. Those that don’t fit inside the box are penalized with higher costs, a second-rate appearance and a notably cramped style. The notion is somewhat preposterous, once you consider how far we’ve come as a consumer society, where a house, a car and an education are attainable by the vast majority, but a decent suit is not. The need for accessible, affordable, and most of all, well-fitting and fashionable men’s suits was clearly there. The seeds for a compelling business opportunity were sown, and together, Vucko and Gani seized it. A guy goes to Indochino.com and picks a suit and sends in his measurements. If he doesn’t know his measurements, he can visit a local tailor or do it himself after watching a step-by-step video tutorial online. Indochino makes the suit from scratch and ships it to your door in two weeks. If the suit doesn’t fit, Indochino will fix it or replace it for free. For your second suit, Indochino simply pulls up your measurements, whips up your new suit and sends it off. Point, click, ship. The constant drive towards improvement is really Indochino’s strong suit, and is actually a bit contrary to the old models. Where most menswear establishments pride themselves with slogans boasting that they’ve “Been doing to the same old thing since 1928,” Indochino evolves and refines itself every single day. Indochino also goes against tradition in its business ethics and practices. Based in China, a nation somewhat marred by its reputation for sweat shops and unfair working conditions, Indochino is highly conscientious about the work experience they offer to their employees. But in spite of all their success, there is one surprising fact about the two enterprising young gentlemen: they still haven’t finished college. With Indochino barreling ahead with cumulative momentum, Vucko and Gani have put their studies on hold to devote their full attention to the growing business, which now has offices in Shanghai and Victoria and will soon be expanding to the States. But that doesn’t mean they didn’t learn anything from their time at UVic. Vucko and his partner have raised plenty of eyebrows in the business world, as well as funds from the likes of former Yahoo president Jeff Mallett, W Media Ventures CEO Boris Wertz and German Internet- and mobile-based investment firm Acton Capitals Partners. Indochino owes much of its success to relationships that were forged through the mentorship program at UVic. Under the guidance of upwards of 20 different mentors, Vucko found his calling as an entrepreneur and began refining his business plan for Indochino. Vucko, it seems, is an impressively quick study. Quicker, at least, than the speed of a bachelor’s program – he learned everything he needed to make Indochino a success with one semester to spare before receiving his formal degree. 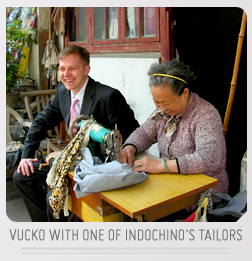 But like his custom tailored suits, Vucko shapes his education and experience to fit his vision. The two draw inspiration from their knowledge and expertise, but in the end, they take an immersive, holistic approach to making their business better and getting a deeper understanding of how everything works in the niche that they are helping to carve out. You can call Vucko and Gani unconventional. Call them unlikely, unorthodox, uncommon. Call them what you want – but the story of Indochino proves that they are anything but unrefined. Full disclosure: Indochino, as you may have noticed, is one of our sponsors. But we don’t advertise anything unless we really, really like it – which means you’ll probably like it, too. I’m a big Indochino fan. I bought one of their suits earlier this year. @Justin, what was your experience like? Did it fit the first time? How long did it take? What’s the quality like. I’ve been really tempted, but I don’t know anyone that’s done it yet. I have bought a few suits and shirts from them. The fit is excellent and the details are great. The customer service is the best in the business. The construction is so-so and the fabric quality varies quite a bit. It’s not a suit you’ll have for 10 years, but it’s a great medium term suit. You get what you pay for. My first Indichino suit arrives in about a week. I’ve heard that the quality has jumped since this article was released. So fingers crossed. And yes, the customer service has been great, prompt, and very patient with me so far. How about a followup article? I look forward to hearing how you like yours! Thanks. It’s a testament to the importance of proper fit and proportion that the simplest and most unassuming suit, a medium grey, can be the most stylish thing a guy can wear if tailored correctly. I’ll definitely let you know how my Indochino Classic Navy fits. And as for a followup, if you get the chance to write up on the founders personal stories and the direction of the business, etc, please do. I’d love to read that. AnotherJames, Awesome, thanks so much for the comment! A follow up on the founders could be cool.